Join fine artist and designer Yvonne Osei speak at the Creative Mornings series, Saturday, April 27th. Join us for the next Creative Process Presented by PGAV Destinations. Wednesday, May 1st from 6pm - 9pm. We are proud to be a sponsor of Fashion Anarchy. Join us on Thursday, May 9th for a one of a kind design contest. Join us for the next Creative Process Presented by PGAV Destinations. Wednesday, August 7th from 6pm - 9pm. Fashion's Night Out: 5th Year Anniversary! Save the date! More information to come but hold October 19th! Join us for the next Creative Process Presented by PGAV Destinations. Wednesday, November 6th from 6pm - 9pm. Join us on Saturday, February 23rd from 11am-3pm. Join us for the next Creative Process Presented by PGAV Destinations. Wednesday, February 6th from 6pm - 9pm. In partnership with the St. Louis Symphony, join us for an unforgettable evening. Join us for a special Holiday Second Saturday at PALM Health on Saturday, November 10th from 12pm-4pm. Visit Miki's Closet, our Fashion Truck, at CAM's First Friday in Grand Center. Join us for the Kick Off Event for the annual Pins and Needles Show! Mark your calendars- the next Creative Process is Wednesday, August 1st from 6pm-9pm. Calling all teens, ages 16-18! Join us in collaboration with COCA for a one week fashion intensive! We’re teaming up with Arch Apparel for movie night on Art Hill, Friday July 20th! Join us at SLAM Underground, Friday, June 29th from 7pm -10pm to shop sale and exclusive Fashion Fund merch. Shop from some of the most stylish closets in St. Louis! Join us at Lusso for a special Second Saturday on Saturday, May 12th. Dwell in Other Futures is a two-day festival of art and ideas that explores the collisions of race, urbanism, and futurism, providing a platform for alternate visions of the St. Louis to come. Who said Shakespeare can't be a party? Join us for a special Bespoke Bridal Second Saturday, Saturday April 14th from 12-4pm. Join us for a chat with Victor Luis, CEO of Tapestry. Monday, April 2nd from 6pm- 7pm. 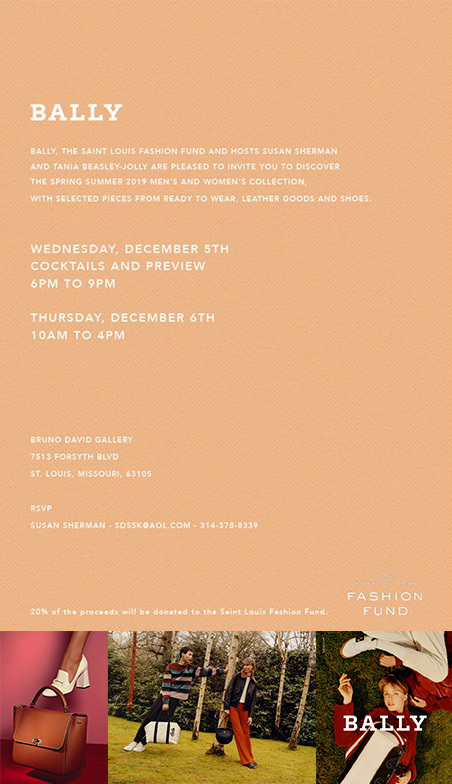 For one night only a Pop Up Shop at Saks Fifth Avenue featuring the Incubator designers Spring Collections as well as brands Rungolee and Richard Tao. Shop the Incubator designers' collections from 12pm- 4pm. Click below for more info about our first Creative Process event of the year. Join us to celebrate the One Year Anniversary of the Saint Louis Fashion Incubator on Saturday, January 13th from 12 pm- 4 pm.